**apologies for the images; I forgot my camera at home and used my phone to document this trip. Fall 2019 brought the full spectrum of weather. 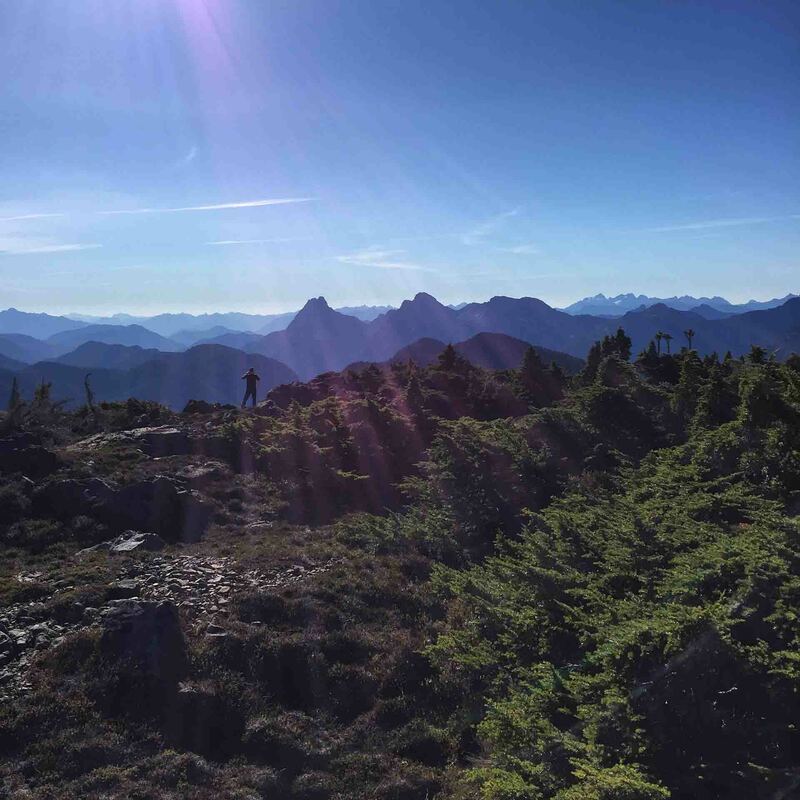 Through many weekends in September and into October, we trudged through dense, wet bush, and on October 13th and 14th, we were treated to a delightful sunny fall weekend. 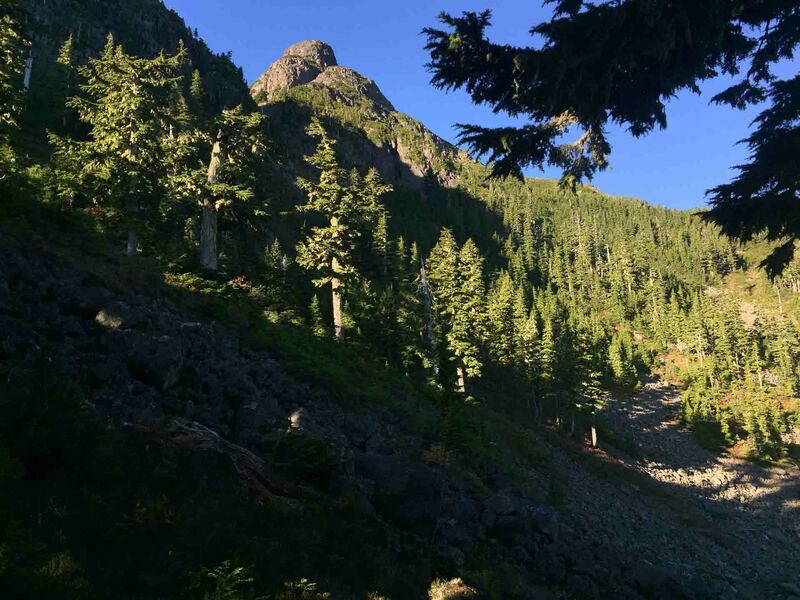 To celebrate the two days of uncharacteristically beautiful weather, I hiked first to Green Mountain with my kids, and then to Tsitika Mountain in the Franklin Range. Phil and Israel, approaching the crack. 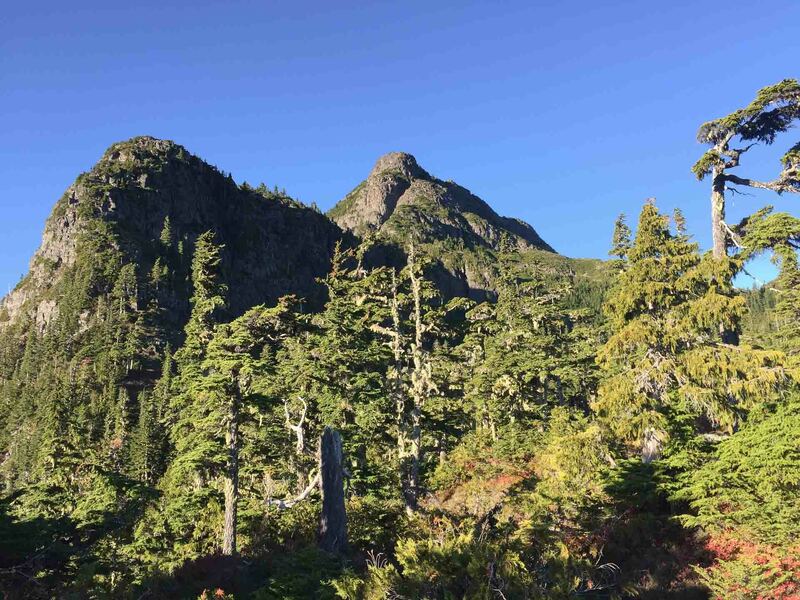 Before setting Tsitika Mountain as our objective, I had only heard of the mountain earlier this year, when I stood atop Mount Derby. At that time, I was just inside the Mount Derby Ecological Reserve, nursing some seriously wet feet, while trying to wait out the dense cloud mass that hung all around us. On October 14th, I was happy to take advantage of the dry, sunny weather and finally set eyes on Tsitika. The drive along the logging road was quick considering the distance. The Tsitika Main parallels the river and penetrates deep into the Tsitika River valley. After crossing the river, the road becomes the Catherine Main and leads along the Catherine Creek. Eventually we diverted off the main road and followed the deactivated spur off Mudge Main to its terminus at 740 metres of elevation. After parking, I noted that we were only 250 metres from the Tsitika Mountain Ecological Reserve (poorly named as most of the mountain isn’t even in the reserve); nothing like logging right up to the edge! The sun shone brightly and illuminated the valley below us. The crisp morning air added to a feeling of exhilaration that put us all in a great mood. We didn’t waste much time enjoying the view before crossing the 100 metres or so through the logging slash and into the old-growth. After the long four-hour drive, my legs felt like they creaked when I took my first steps– I was ready to get hopping! 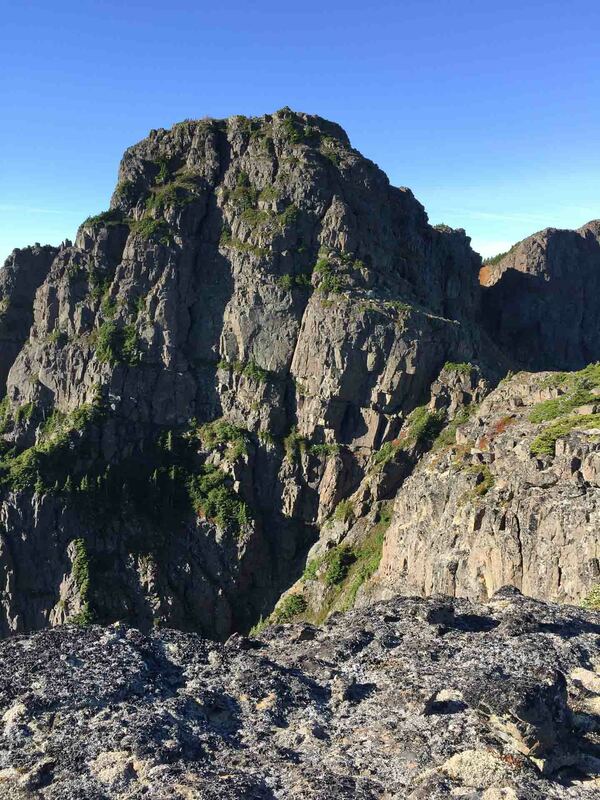 We planned to follow the east ridge of Tsitika Mountain to the summit. We hadn’t gleaned much from the beta about this route because the little we found described a different approach. Compared to the bushwhack on our Maitland Mountain excursion, the light bush between 700 and 900 metres elevation was but a tickle against my body. We moved quickly up the crest of the ridge as it parallels the Tsitika Mountain Ecological Reserve. The route gains elevation gradually — I’d call only a few spots steep — and the navigation was easy. In a few places, small rocky outcroppings diverted us away from the crest of the ridge, but these were easy to route around and are hardly worth mentioning. 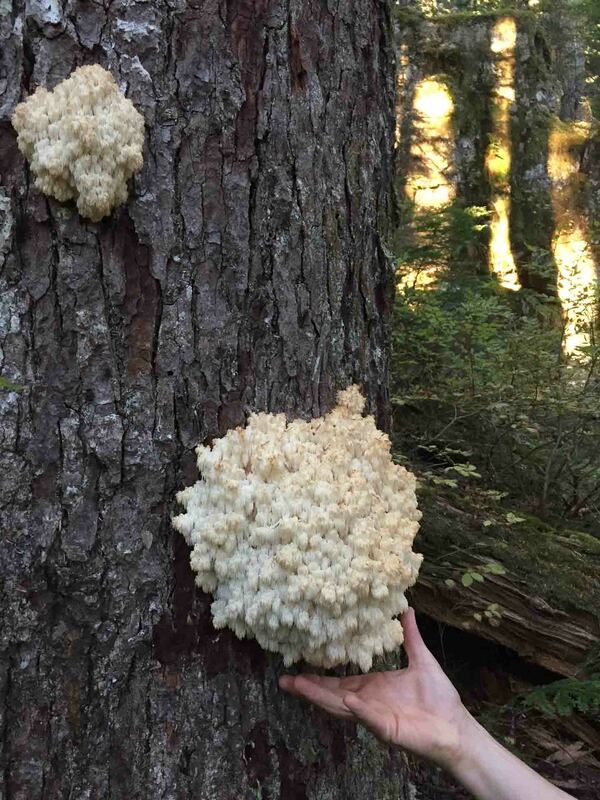 We took breaks to admire the wide variety of mushrooms, and, when we got them, the views of Robson Bight –no whale sightings for us. 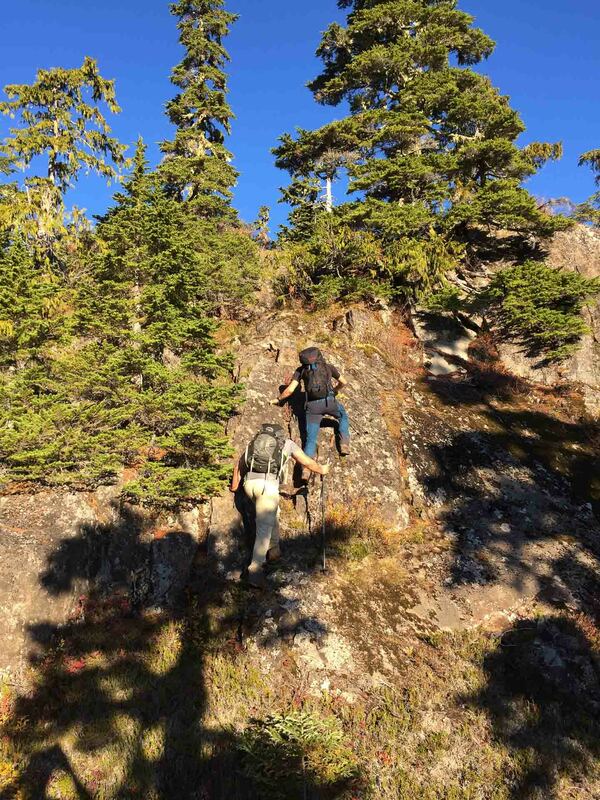 Above 900 metres, we left the worst of the bush behind us; around 1150 metres the large evergreens thinned, and a dense mat of crowberry eased our footfall. It’s around here that I could finally see the ridge rising ahead of us. Although we debated following the ridge as it climbed much higher, we diverted into a boulder field to the right, and then up a hill to the saddle to the north of the massif. We were in high spirits as we worked our way through some krummholz (venturing farther to the right would avoid this, as we discovered on our return route). Once we cleared the light bush, we scrambled our way up a series of easy-to-navigate ledges toward what we thought was the summit. 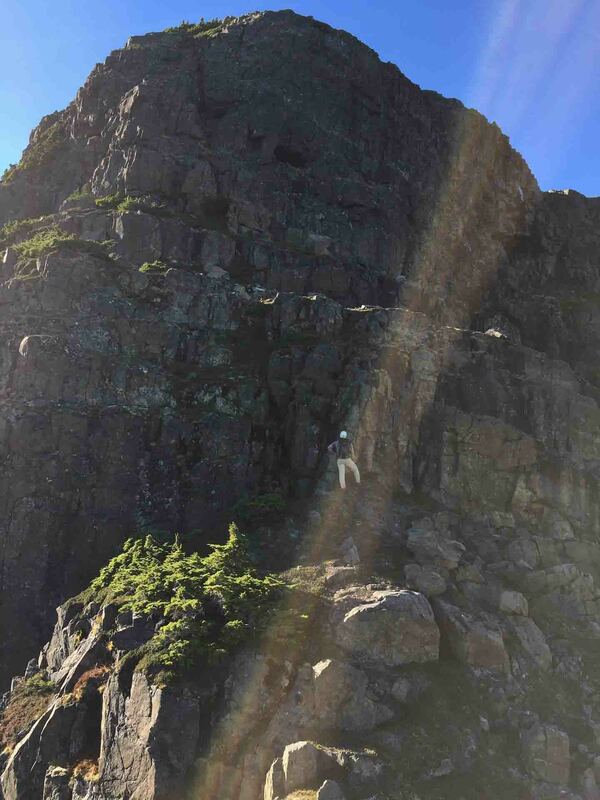 Below a dominating rock wall, I cut to my right and followed a crowberry-filled gully to the level above. 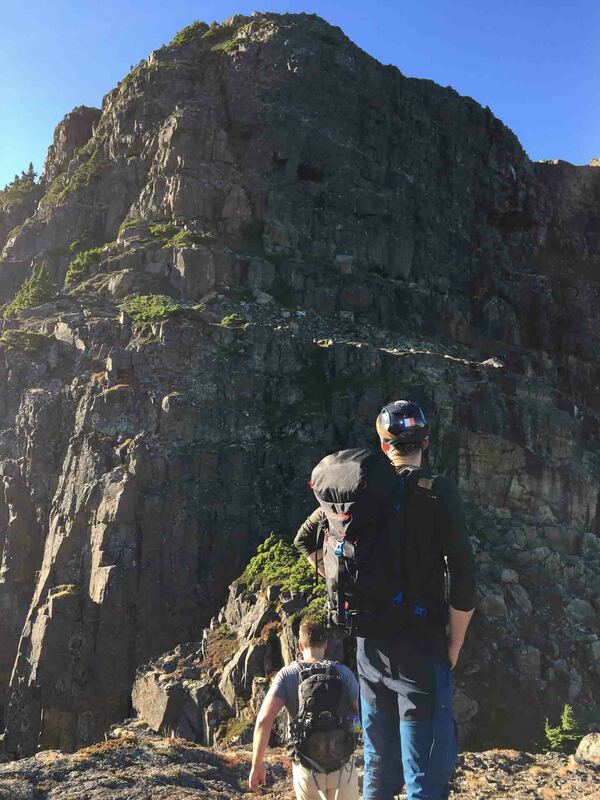 While Israel crawled up behind me, I waited for Phil to climb his “high-fifth” route up the crazy rock wall, and together we followed the alpine ridge up over the hump to our final obstacle: The Crack. Standing below the final wall, we craned our necks looking for a route. Rather than attacking it immediately, we took a long break to eat our snack and search the wall for options. I ruminated as I chewed, and was soon full of doubts. The only reasonable option was the crack that ran straight up the middle, originating from a two-metre-high bush. Phil considering his options below the crack. 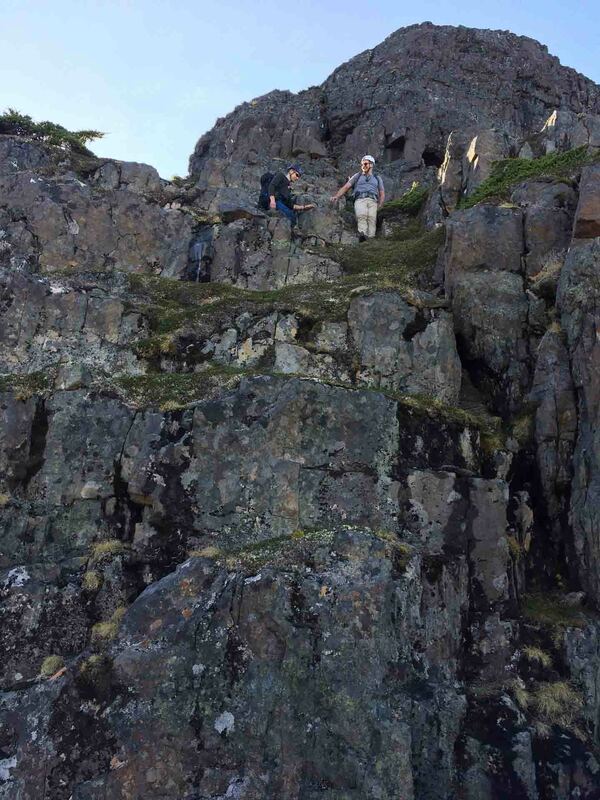 Fearless Phil led the foray, while Israel and I sat back and let him work his magic –mostly to avoid rockfall. Phil worked his way up to the tree and into the crack. As he scrambled up, the depth of the crack was revealed — it’s more of a chimney. It was clear that there were many hand- and footholds, and once Phil was up, Israel and I were quick to follow. 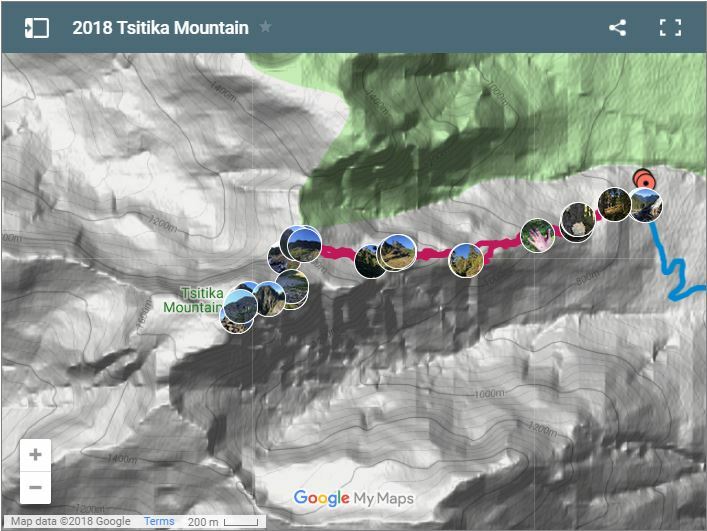 It wasn’t long before all of us were standing on top of Tsitika Mountain, having overcome the exposed third-class (maybe fourth-class) route to the summit. The reward for our efforts was laid out in 360 degrees all around us. 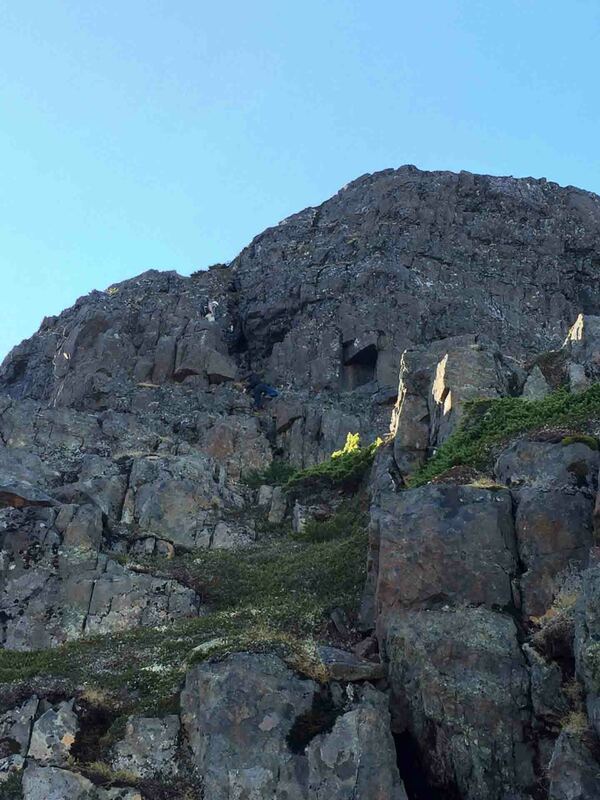 We could see the entirety of the Bonanza Range that we climbed in 2016, Derby, Mount Waddington, and massive glaciers on the mainland, as well as Johnstone Strait, other peaks we have climbed, and dozens of bumps we haven’t. We took our time to enjoy the warm sun and the cool breeze on the summit. When it came time to descend to the ridge, I was the first to clamour down the chimney. I couldn’t get a good photo, as I forgot my camera at home and was stuck with the fixed lens offered by my phone. From the summit to the car took around 2.5 hours. It was easy to push our way back through the bush. I had a fright at one point, when I looked down at my hand because it was moist. 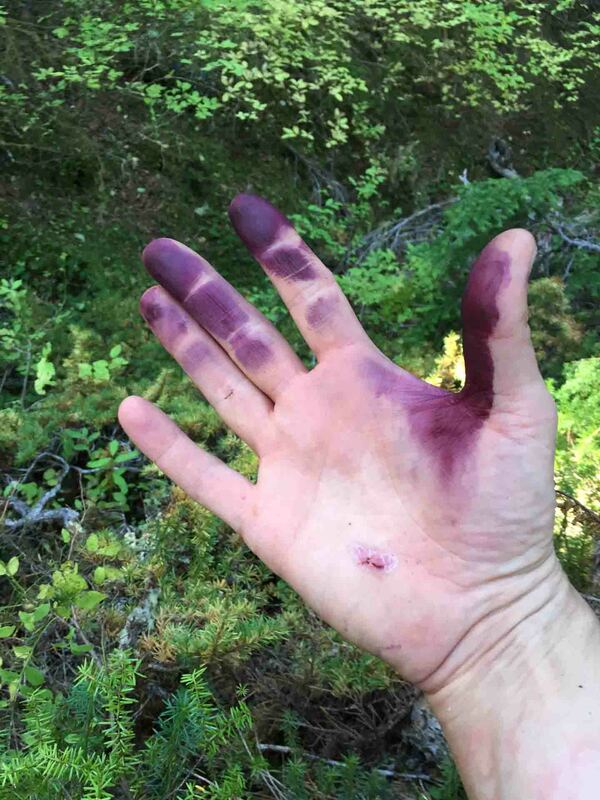 At first, I thought I was bleeding, but had to blink and remove my sunglasses to get a final look — to see that a single blueberry had got between my hand and the pole. Back at the car we celebrated the day and congratulated each other on a job well done. Mostly we revelled in the beautiful weather. I hope to get a few more days like this before the snow comes. If you’re considering a jaunt up Tsitika Mountain, leave it for a dry, warm day. Though water and snow would offer little impediment to the base of the massif, I’d wager that rehydrated lichen and frozen, ice-covered rock would make the final push to the summit far more difficult than it needs to be.